Thomas Sedran played a key role in negotiations between VW and Ford to start a commercial vehicles alliance. WOLFSBURG, Germany -- Volkswagen Group expects that a strategic partnership with Ford Motor Co. would not unequally favor the German automaker even though it is nearly twice the size of its U.S. rival, said a key VW executive behind the potential deal. VW and Ford said in June that they were considering a joint development and production alliance that would include light commercial vehicles and could strengthen the companies' overall competitiveness. The goal would be to form a "strategic alliance," an upgrade over the industry's more common project-based cooperations. In his first public comments about the potential tie-up, Thomas Sedran said he was confident a final deal could be reached that would ensure both sides benefit equally. "When we finalize this alliance, you can be assured it will be balanced. There is no junior, nor senior partner, but rather two companies at eye level that will closely cooperate with one another," he said during an interview at VW's headquarters here. "There might be specific years where there will be a difference in production volumes, but in the sum total it is very balanced," he said, praising the early results from the teams performing due diligence. In his former job as VW's head of group strategy, Sedran played a key role in bringing the companies together. On Saturday Sedran took up a new role as CEO of VW's light commercial vehicle division. In terms of numbers, VW dominates Ford. It delivered 10.7 million vehicles worldwide last year, generating $268 billion in revenue vs. Ford's 6.6 million vehicle sales and $156 billion in revenue. This kind of mismatch has led to conflicts in the past. A similar strategic partnership that Volkswagen struck a decade ago with Suzuki bitterly collapsed after the Japanese company felt it was being bullied. Suzuki sued successfully to get back the 20 percent stake it had sold VW. VW's market capitalization is twice that of Ford's. Unlike with Suzuki, however, there are no equity interests or cross-shareholdings envisioned this time. Volkswagen believes a deal could generate at least $464 million annually in gross added earnings in the midterm by focusing its initial efforts on the joint development and manufacture of light commercial vehicles such as delivery vans and utility trucks. "I wouldn't rule out anything [on the car side], but the focus is let's first get the LCV projects running," Sedran said. "We want a concrete project vehicle that has a start of production and a certain volume, and then can talk about other issues." Ford and VW previously cooperated on large minivans with the Volkswagen Sharan and Ford Galaxy built at the jointly owned AutoEuropa plant near Lisbon, Portugal, starting in 1995. Ford later sold its share to VW and moved the Galaxy onto its global C/D-segment platform that also underpins models such as the S-Max minivan and Mondeo sedan. "Ford was a logical partner. Other companies are already in alliances, but now the two market leaders in Europe are joining forces," Sedran said, adding that each only controls about 15 percent of the European light commercial vehicle market. That means he sees little risk that antitrust authorities might try to prevent a deal. "The product life cycles are a good match. We will build for them. They will build for us." Sedran declined to reveal the range of planned projects, but several people familiar with the matter told Automotive News Europe that Volkswagen was looking to save development costs on a second-generation Amarok pickup. First debuting eight years ago, the VW truck that competes with Ford's Ranger is the only one of the group's 300-plus models to use body-on-frame construction common to pickups. The Amarok, built in South America and Europe, is not homologated for sale in the U.S. When rival Mercedes-Benz became the first premium brand to offer a pickup in November, it saved costs by using the Frontier's body-on-frame architecture supplied by partner Nissan. The X 250 d model even borrows the Japanese automaker's 2.3-liter engine -- only the flagship V-6 model comes with a Mercedes power plant. VW unveiled the Tanoak concept in March at the New York auto show. While the vehicle earned plaudits, insiders say it is unclear whether truck buyers would consider a unibody truck like the Tanoak when others, except the Honda Ridgeline, are body-on-frame. While the Amarok is the most obvious project in which VW is interested given its unique characteristics and advanced age, it is not the last. VW's Crafter cargo van had been a largely badge-engineered Mercedes Sprinter built in a Mercedes factory until the cooperation ended in 2016. Mercedes wanted to redirect the 50,000-unit annual capacity set aside for the Crafter for its own growth. The volume for the new Crafter, launched last year and developed by Volkswagen, has been modest compared with ambitions, however. Only 31,100 vans were delivered to customers through July worldwide, a fact officials attribute to the complex ramp-up of a model offered in various dimensions, body styles and drivetrain combinations. Ford is successful with the Transit commercial van and its Tourneo passenger version, achieving global volumes that exceed those of VW's respective Transporter and Multivan, the sixth-generation of the vehicle better known as the Microbus. "The problem is Volkswagen's other light commercial vehicles are all only a few years old -- the Caddy and Transporter were launched in 2015 and the Crafter only last year," said a source familiar with the talks, doubting these models would be able to contribute materially to VW's midterm synergy target. Many light commercial vehicle models are in the market for a decade or longer before being replaced, so it could be years before any of the trio is built on a Ford-VW joint architecture. 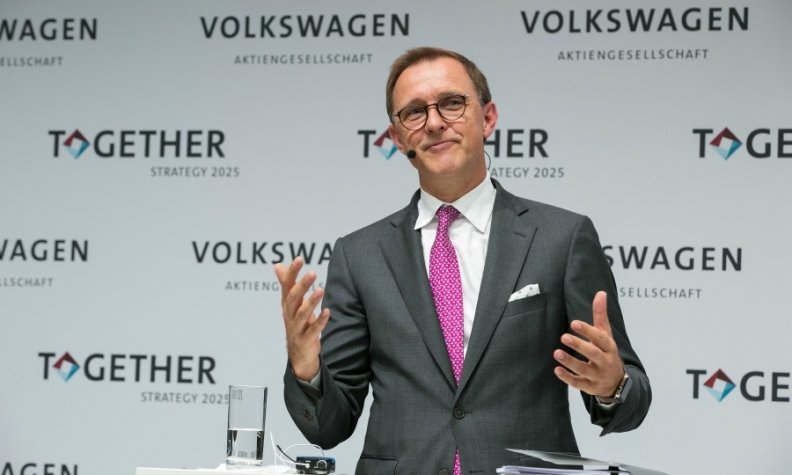 Although Sedran's predecessor succeeded in lifting VW's light commercial vehicle division's operating margin by 310 basis points to 7.2 percent last year, he is still being benchmarked against Mercedes' 9 percent. Sharing costs with a partner would help protect returns. "We have to undertake enormous efforts to fulfill our emission targets and we see in the plans that the expenditure per vehicle is increasing considerably," he said. When Sedran sells a car version of a commercial vehicle, European regulators apply the same stringent fleet emission targets it applies for a Golf compact car even though a Multivan is much larger. "That was one of the drivers behind the talks with Ford, which has similar challenges," Sedran said. One aspect that might help forge ties is Sedran's skepticism about launching any commercial vehicles like the Crafter or Transporter in the U.S., which he does not believe is growing fast enough to support the entry of another player such as Volkswagen. The first product he thinks could have a realistic chance to compete there would be the full-electric I.D. Buzz van expected in 2022, Sedran declined to comment on whether Ford might gain access to VW's scalable MEB architecture for battery-powered vehicles. When asked whether he expected a deal between VW and Ford to be signed by year end, Sedran said he was optimistic. "We realized fairly quickly that it worked from a cultural perspective and there was the right chemistry with the main actors," he said. "At the end of the day both sides need to sign, but I'm confident since it's all been constructive and in a spirit of partnership."